Last night I saw the Minnesota Opera production of the world premiere of The Fix(Joel Puckett, music; Eric Simonson, libretto). I anticipated West Side Storymeets Field of Dreams with athletic, Jerome Robbins-style choreography. What I got was a delicately wrought, gorgeously orchestrated, beautifully sung paean to a lost American dream. The Fix is about the White Sox throwing the 1919 World Series and facing the music. It towers above other premier commissions here (one a year), many based on movies, that adhere to the parlando conventions of 21st century American opera, shy of long melodic lines, duets and trios, and standout vocal writing. The Fix fixed all that. Puckett should be a household word. He uses a fresh idiom inflected with a southern twang especially appropriate to the story of Shoeless Joe Jackson. He employs his large orchestra to create a kaleidoscope of delicate sonorities as well as grand orchestral gestures. The rhythms shift subtly with a certain relentless ticking and chiming that drives the tale forward. The music serves the libretto, often to a fault, and Puckett is unafraid of a swelling melody, the meat and potatoes of the standard repertoire. Ring Lardner’s aria, “I love this team, Hugh,” is an anthem to the dream of human perfection even in so unlikely a candidate as the illiterate “country bumpkin,” Jackson. It is a standout moment movingly sung by Kelly Markgraf. It’s why we bother to go to the opera at all, and so rarely get in the landscape of new compositions that leave melody to Broadway. The cast is enormous, 20 singers. The ensemble is the real triumph here. Each character is distinct and the voices are uniformly accomplished. 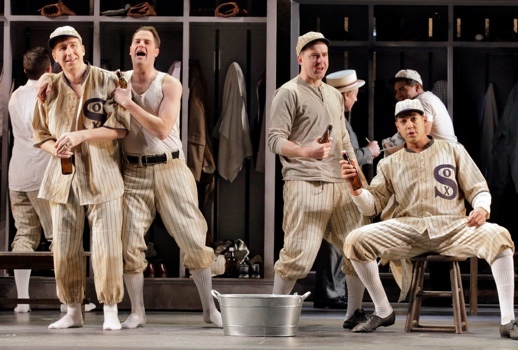 Special kudos to Minnesota Opera for using a multicultural mix for the eight white White Sox players and for casting an African-American woman as Joe’s wife. It’s good to keep us on our toes and remind us how things have and haven’t changed. The opera is a magnificent gift to the entire ensemble, offering a wide range of musically distinct character parts. To these ears, the standouts were Wei Wu as Chick Gandil, Margraf as Ring Lardner, and Joshua Dennis (the Duke of Mantua here last season, and Roméo before that) as Shoeless Joe. They sang so cleanly that I rarely had to look at the supertitles. The only significant female role was Joe’s wife. The lack of female leads was somewhat unavoidable, but at least they worked Katie in, sung by Jasmine Habersham. She’s young, with a Papagena-Despina-Norina background and a lyric future judging from the heft and bloom of her voice. The production itself is handsome and effective. A unit set, the backside of Comisky Park, functions dramatically and allows for constant cinematic scene shifts from bar to kitchen to court to playing field. Flexible, engaging, and it worked. I saw the first night. By the end of the run the kinks should be worked out, the performances less cautious. Judging from what I saw, Joel Puckett and Minnesota Opera hit it out of the park.